• Preheat oven to 350º. Grease 4 or 5 oven-safe custard cups or ramekins with butter. • In a blender, combine the sweet potatoes, milk, eggs, sugar, spices, and vanilla. Blend until smooth. • Pour blended mixture evenly between prepared custard cups, about ¾ cup per dish. 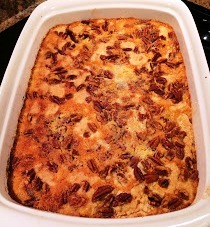 • Sprinkle;e the top of each custard with about a teaspoon of chopped pecans. • Place custards on a baking sheet and bake for 25-30 minutes or until browned, set in the center, and slightly puffed. • Serve warm or chilled. The American Farm Bureau Federation’s 30th annual informal price survey of classic items found on the Thanksgiving Day dinner table indicates the average cost of this year’s feast for 10 is $50.11, a 70-cent increase from last year’s average of $49.41. 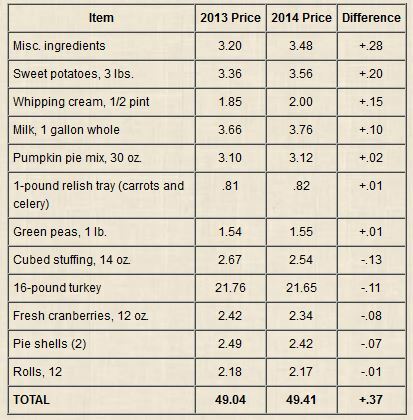 The stable average price reported this year by Farm Bureau for a classic Thanksgiving dinner tracks closely with the government’s Consumer Price Index for food eaten at home. For October, the most recent month available, the food at home CPI posted a 0.7 percent increase compared to a year ago (available online at http://www.bls.gov/news.release/cpi.nr0.htm). A total of 138 volunteer shoppers checked prices at grocery stores in 32 states. Farm Bureau volunteer shoppers are asked to look for the best possible prices, without taking advantage of special promotional coupons or purchase deals, such as spending $50 and receiving a free turkey. The American Farm Bureau Federation’s 29th annual informal price survey of classic items found on the Thanksgiving Day dinner table indicates the average cost of this year’s feast for 10 is $49.41, a 37-cent increase from last year’s average of $49.04. In a medium bowl, stir together the pumpkin, milk, sugar, vanilla, cinnamon, and nutmeg. Pour the mixture into a greased 9×13 baking dish. Sprinkle cake mix evenly over the pumpkin mixture. Sprinkle pecans on top of the cake mix. Bake uncovered for about 45 minutes or until golden brown. Serve with or without whipped topping. Just like most years, Thanksgiving has snuck up on me once again. Fall always flies by with harvest, and as always this year finds me looking forward to an excuse to indulge in meals with great company. While I have much to be thankful for, including the ability to sit at a table full of food, I also must give thanks and gratitude to where it is due – to the farmers and ranchers who have raised the food we will enjoy with care. As an added bonus, this year’s Thanksgiving dinner actually decreased in cost according to an American Farm Bureau survey of grocery costs across the country. Not by much, 44-cents, but when the rest of living expenses are climbing affordable food is something everyone should be thankful for. 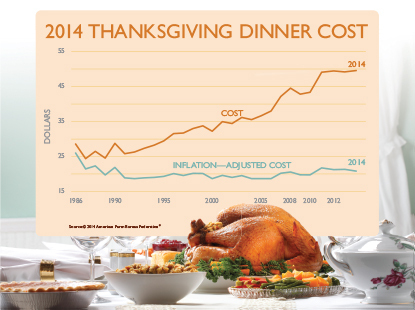 According to the nationwide survey, the average cost of this year’s feast for 10 is $49.04, down from $49.48 last year. That’s less than $5 a serving – you can’t even get fast food for that! The big ticket item – a 16-pound turkey – came in at $21.76 this year. That was roughly $1.36 per pound, a decrease of about 3 cents per pound, or a total of 47 cents per whole turkey, compared to 2012. 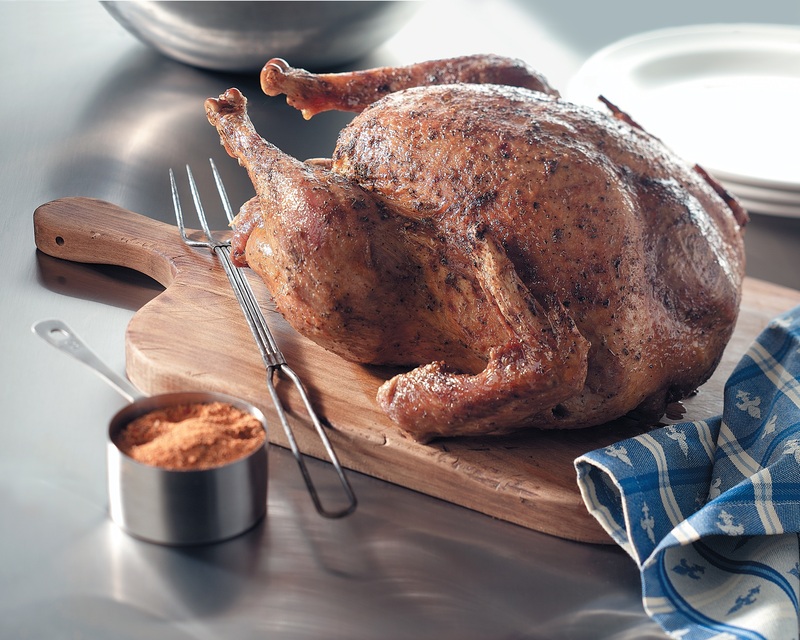 The whole bird was the biggest contributor to the final total, showing the largest price decrease compared to last year. The AFBF survey shopping list included turkey, stuffing, sweet potatoes, rolls with butter, peas, cranberries, a relish tray of carrots and celery, pumpkin pie with whipped cream, and beverages of coffee and milk, all in quantities sufficient to serve a family of 10 with plenty for leftovers. The average price reported this year by Farm Bureau tracks closely with the government’s Consumer Price Index for food eaten at home, which showed a 1 percent increase compared 2012. This year we can all be thankful that Thanksgiving dinner will not take a bigger bite out of our wallets and allow us to make dinner time memories with our family and friends, and I ask you to take a moment and include a thankful thought for all farmers and ranchers! – Kassi Williams is a proud farmer’s daughter raised on a cow/calf and grain farm. 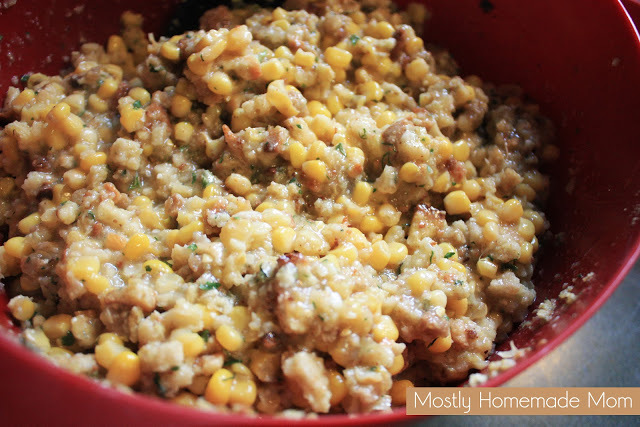 Stir until ingredients are well incorporated and stuffing has become moistened. Pour into a 2 quart baking dish and bake at 350 for about 30 minutes. Allow dish to cool for about 5 minutes before serving.